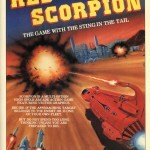 Red Scorpion was a rather poor Spectrum (http://www.worldofspectrum.org/infoseekid.cgi?id=0004076) and Amstrad 3D game that got fairly slated in the press. It was published by Quicksilva and is basically a souped up Battlezone clone, but lacking the soup. The game adverts mentioned a C64 conversion coming soon, but sadly it never surfaced. Maybe this was another case of a 3D game which was too hard for the guys to convert to a C64? … It seems to be the common problem back in them days. A lot of research required, as we have no programmer/artist/musician leads to follow up just yet. 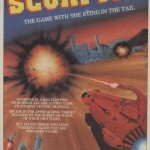 The only thing we know is that the Speccy and Amstrad versions made it, and also additionally that the game was originally called just "Scorpion" (See the adverts to see).